Viking is the Maduro with dark and sweet notes. Hints of Chocolate and fruits. Medium to Medium + in strength. Leiv Eriksson was son of the Norwegian Eirik Raude and grew up in Greenland. Nobody knows exact when he was born or when he died (He probably died before 1025). According to Erik Raudes Saga, Leiv Eiriksson sailed to Norway in the year of 999 where he became a HIRDMANN with Olav Tryggvason (a well known Viking that fought many battles and became king in Norway in 995). He accepted Christianity, and was in charge of introducing Christianity to Greenland. The Greenlands saga tells us that Leiv Eriksson planned expeditions of discovering land, and in the year of 1000 he discovered land. The land with white planted wheat fields and grapes. He called it Vine Land. Leiv was a Viking that traveled with open boats over the seas to discover new land. The saga tells us that he was the first to discover America. The Viking is a unique blend from the master blender Ernesto Perez Carrillo. Blended by Ernesto Perez-Carrillo and produced at the Dominican Republic by Tabacalera La Alianza. The box/cigar band has a unik design and material. Every single one is in metal and is hand polished. The cigars comes with a raugh box design in silver and black. 25 cigars in each box. Norseman with its dark Connecticut wrapper and shaggy style has more flavours. Creamy, long after notes, and medium to medium + in strength. Viking age, Nordic term for the period ca 800-1050 (early middle ages). The traditional view has been that the Viking activity in the west was marked by looting, while Viking voyages eastwards was more of a trading expeditions thing. 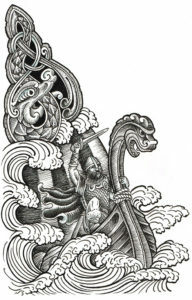 The variety of Viking ships shows that they were built to a purpose. Some used for fighting where they could board wherever they saw land, and others to carry up to 60 tonne of weight. The biggest ones could have a crew with over 100 persons. Some of the boats were row-boats only with up to 80 rowers (referred to the biggest discovered ship) while others were equipped with sail. The boats were open and they were all exposed to the mother nature. The sea was a dangerous place. The North sea that the Viking used to go to Britain could be wild with waves up to 30 meters (monster waves). 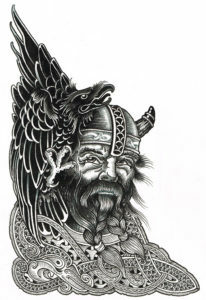 Norseman is an honour to the old Vikings that spent they’re lives traveling the North Sea. Norseman is the shaggy one. The consept of using the shaggy style is to give the cigar a rough look and a boost in flavours when the wrapper kicks in. 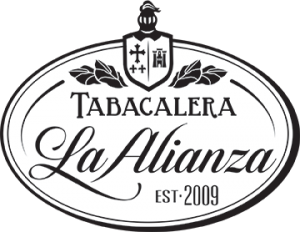 Blended by Ernesto Perez-Carrillo and produced at the Dominican Republic by Tabacalera La Alianza. The box/cigar band has a unik design and material. Every single one is in metal. The cigars comes with a raugh box design in gold on black. 25 cigars in each box. Nordic warrior with the Sumatra wrapper is a tasty cigar. Smooth, nutty and rich flavors with a medium strength. By the year of 976 there was no such thing as innocence. The Vikings haunted Europe for 250 years and they all were looking for optiones to make the Vikings go away. Oh Yes, the European people soon learned to fear the Vikings. They often prayed that the Vikings should go pass them and do their things somewhere else. Agnar had just turned 23. He was a Northern Warrior. As his Father and his father was before him. He was good in what he did! Agnar slept with his sword. 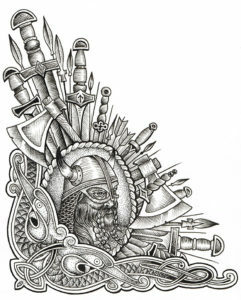 He was a fearless Viking, a Northern Warrior. Agnar carried his sword day and night since the age of 12 when his father brought one home for him. A gift from one of his many crusades to Europe. Agnars life was simple. Eat,fight and sleep. He was just an ordinary man, a Northern Warrior like many others before and after him. Vikings that made history. Nordic Warrior is the natural one with pigtail. The beautiful Sumatra wrapper has a smoothness and aroma that will give vibes. Blended by Ernesto Perez-Carrillo and produced at the Dominican Republic by Tabacalera La Alianza. The box/cigar band has a unik design and material. Every single one is in metal. The cigars comes with a raugh box design in black on gold. 25 cigars in each box.